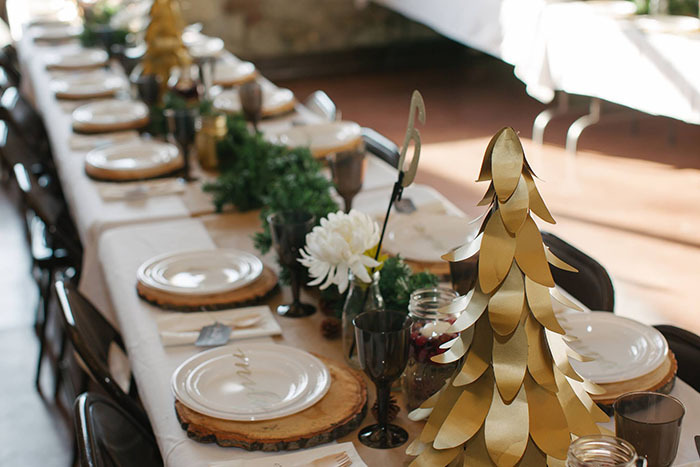 Yesterday, I was delighted to share a glimpse into our wedding reception and a few DIY ideas you could recreate for your holiday dinner party. 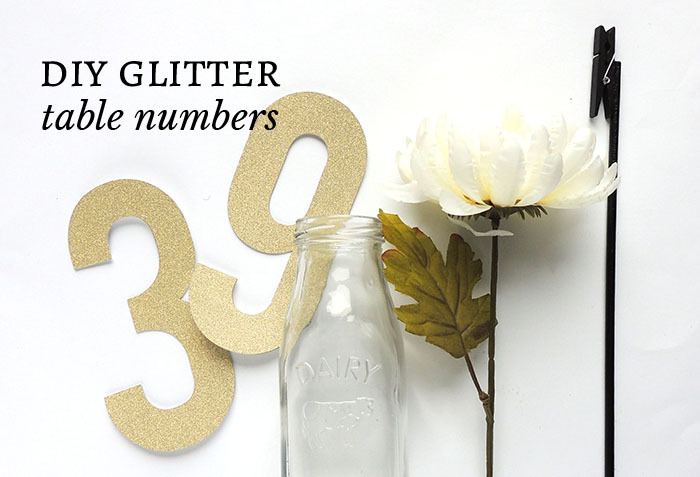 Today, I'm back with a few more ideas including glitter table numbers and name cards. Read on to see more, but first catch up on yesterday's post if you haven't already. 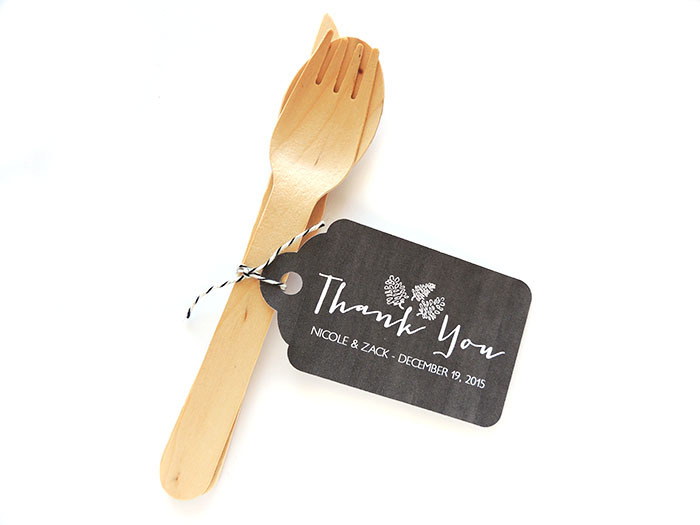 Let me start by sharing what was placed at each place setting: Handmade wood charger, dinner and salad plate, glitter die cut of guest's name, black wine glass, napkin, and wooden utensils with thank you tag. You read that correctly. Wooden utensils. 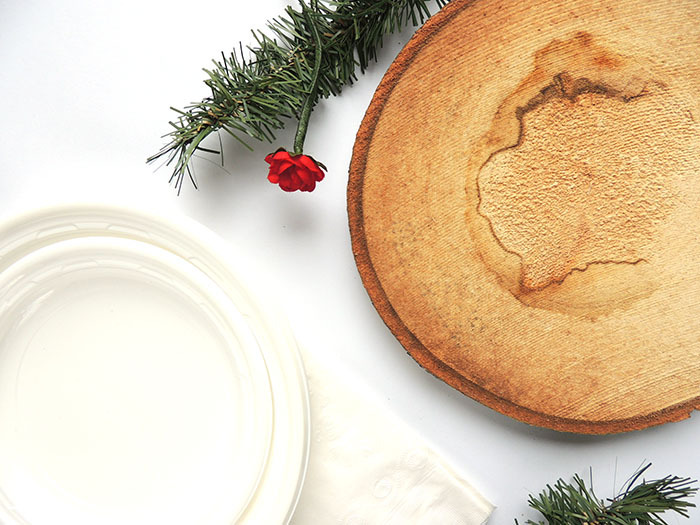 We found biodegradable, disposable silverware sets at Joanne Hudson. 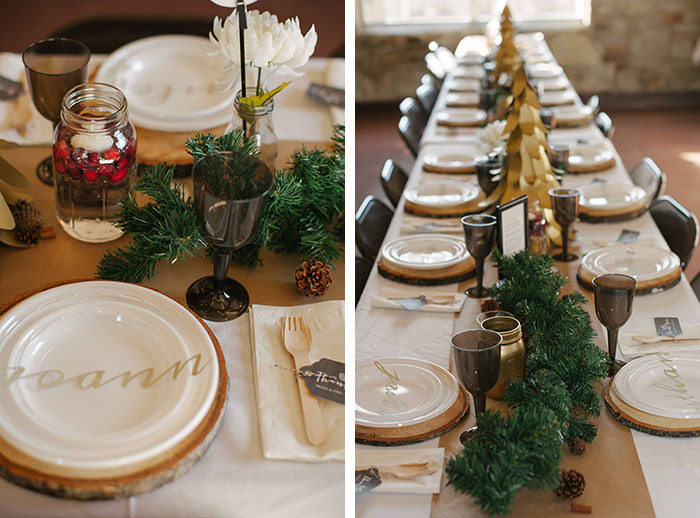 This meant no one was slaving over a large sink of dirty dishes, and the color and texture added to our rustic affair. I highly recommend these for your next event as an alternative to plastic. 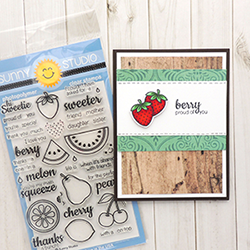 Thanks to the Print and Cut feature on the Silhouette Cameo, the thank you tags were a breeze to create. The feature is exactly as it sounds. You print the image with your home printer, and the Silhouette cuts it out. Cutting 100 tags by hand would have taken days. Who knows if it would have ever been completed! Instead, 20 minutes, this cut file, and a simple tutorial had them ready to go. The Silhouette Cameo was a huge help when it came to creating the table numbers and name cards. Silhouette's software gives the user the ability to cut any font available. We were able to use the same fonts as our wedding stationery to create these pieces. For the table numbers, I cut numbers 1 through 12 from American Crafts POW! Glitter Paper. This is the most amazing glitter paper on the market. 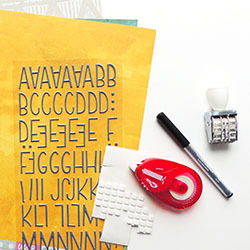 The pieces of glitter are fused to the paper, making it mess free and easy to cut with any machine. I cut a second set of numbers from thin chipboard and adhered the two together for stability. If you prefer the backside to have the same color, you could flip the cardstock over when cutting a second set. I spray painted 12 wooden dowels and adhered black clips to the top of each. 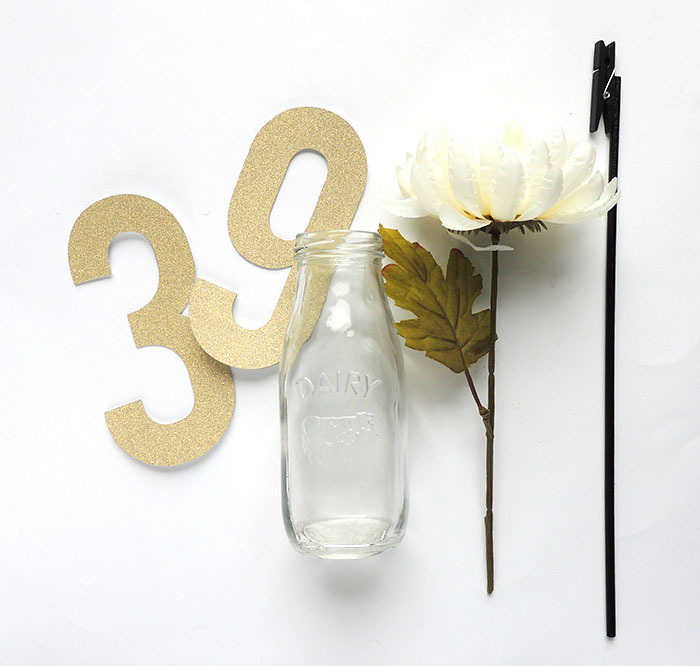 The clip held a table number and was slipped into a glass jar with a simple white flower. To create the name cards, I cut the name of each guest from the same color of POW! Glitter Paper. This may seem like a large task, but it was completed in one afternoon thanks to (once again) the Silhouette Cameo. The weld feature allows you to piece together shapes for a seamless cut. 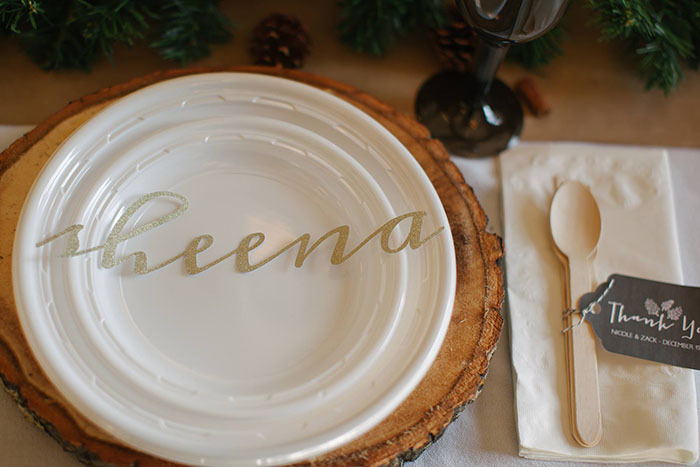 While these were far more delicate than your traditional place cards, we loved the look stretched across each plate. Many of our guests were caught taking pictures with their name and taking them home at the end of the night. Lastly, I wanted to share the frames you see at each table. I printed love quotes from our favorite TV shows and slipped them into Tolsby frames from IKEA that were spray painted black. 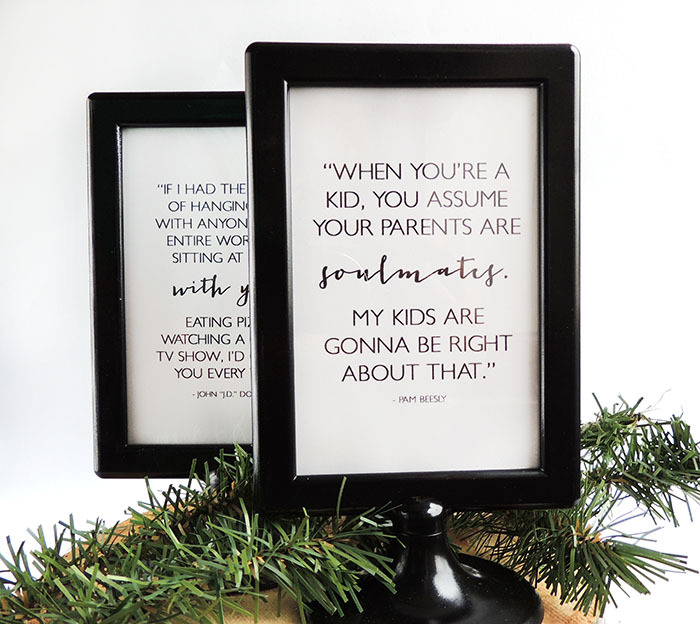 If you're using the last few posts as inspiration for a holiday party, these frames would be perfect holding quotes from your favorite Christmas movie or holiday song. 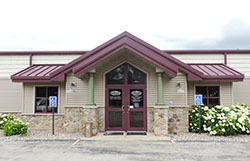 Thank you so much for following along, and we hope you've found an idea or two to use for your next event. As you can see, we love our Silhouette Cameo and recommend it for every DIYer. Last minute Christmas gift idea? We think so.